Brevak Racing is very grateful to our Sponsors! In fact, we say “Three Cheers” for them – for their support and assistance is what drives us to win! Thanks for being a fan, too, not only of Brevak Racing, but of our Sponsors too! Legendary Waters Resort and Casino. Chief Buffalo canoed all the way to D.C. to preserve this place for his people. They said they wouldn’t build anything here that didn’t honor him. Legendary Waters Resort and Casino was designed to commemorate a lifetime of love for this land and its waters. And as you play their casino floor, or head outdoors for hiking, biking or sea kayaking around the Apostle Islands, you’ll see their first priority is paying tribute to the National Park that they are part of. 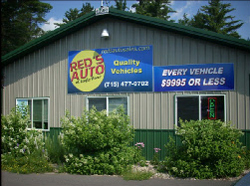 Red’s Auto is proud to be known as the largest used car dealer in the area, carrying the FINEST QUALITY late model cars, trucks, vans, SUV’s, and Utility Vehicles. These pre-owned vehicles are rated second-to-none! The Budget Lot, located just a block from the main lot, carries every type of vehicle, and they are all priced at $6,995 or less. Red’s also carries a select inventory of classic cars. Power Balance™ is committed to bringing performance innovation to every athlete in the world from professional to recreational. We want everyone, no matter their level of activity, to maximize their potential and live life to the fullest. Performance is critical to their success. Power Balance™. Created by athletes for athletes. G-FORCE Racing Gear®. With inventory, catalogs and product website in circulation, officials at G-FORCE Racing Gear are proud to announce the launch of the all new Powersports Division. The launch begins with helmets and related products and will continue to expand in areas that prove to be a solid fit for G-FORCE Racing Gear® Powersports.